As I’ve studied the bible, I have concluded (as of today) that the only reason I am in a relationship with the God of the universe is because He set His affections on me and chose me before the foundation of the world to be His. He provided His Son to take my punishment. Because the God of mercy is also righteous, I was unable to come into this relationship apart from that provision – the death and atoning sacrifice of the only perfect One who ever lived. Because of the mercy shown to me, I have assurance of more life beyond this one on earth. I possess a secure hope – the kind of hope that believes something to be true, even though there is only unseen evidence of it. In these wintry months here in South Dakota, I’ve chosen to be involved in two small-group bible studies. I am learning so much from being a part of these. One of them consists of a group of ladies that are 10 years (or so) older than I am. The other is a group of ladies that are 10 years (or so) younger than I am. I benefit spiritually and practically from listening to them share what they are learning and putting into practice. It’s wonderful to learn from new mommies and from seasoned grandmothers. Right now, I am especially thankful for the timing of these particular studies. Our younger women’s group is working through a Beth Moore study on the life and ministry of Paul. In the other one, we are doing a more in-depth Precepts study, digging into one of the letters that Paul wrote to the church at Corinth. So my blogging (my thoughts put to the page) is just a reflection of my processing … and my rehearsing … and my gratitude. I made a decision to become a disciple of Christ when I was a child. I ask God to forgive of my sins, and I believe that Christ saved me. Of course, it was not by any good deeds I had done or would ever do, because then I’d have something to brag about in salvation. Nope, He saved me FROM myself and TO Himself. It was a gift. Apart from Christ I would only be foolish, disobedient, misled, enslaved to various passions and desires, spending my life in evil and envy, hating others. But because the kindness and love of God my Savior was shown to me, I was rescued from all of that. And it was only on the basis of His mercy, through a new birth and the power of the Holy Spirit, that I have been justified by His grace, and I am now an heir with the confident expectation of eternal life! 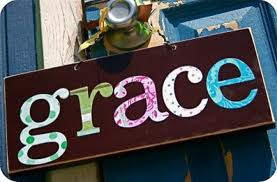 Thanks be to God for amazing grace.